From Oct to March, our wildlife & cultural holidays to Sri Lanka combine a safari to see leopards in Yala National Park, with elephants in Minneriya & Udawalawe & a flight to spot Blue whales. Visit Dambula Cave Temple, Sigiriya Rock, Polonnaruwa, Temple of the Tooth in Kandy & the Tea Country, then relax on the beaches of Galle. English speaking guide, all transfers, game drives & specified sightseeing included. You will be met at Colombo Airport and taken on an orientation tour of this city, which is the commercial and industrial centre of Sri Lanka. The city was built by the Portuguese in the 16th century and today consists of an eclectic mix of grand colonial buildings, modern offices and bustling local shops. We visit the vibrant Pettah Market and the National Museum, with its fine collection of antiques and Sri Lankan art. We also visit a Buddhist temple and a Hindu Temple, to experience the diversity of religion and customs of the people of Sri Lanka. Then check into your hotel and relax in this harbour city, situated on an ancient trading sea route. This morning your driver/guide will collect you from your Colombo hotel and introduce you to the beauty of central Sri Lanka as we travel 4.5-hours to the Cultural Triangle. Along the way we stop at the Millenium Elephant Foundation, that works to improve the lives of domesticated Asian elephants. You can walk with the elephants and interact with them as they bathe. As they have only a small number of elephants here, this offers a more personal and humane alternative to Pinnawala Elephant Orphanage, which is very busy. At Dambulla we explore the famous Golden Rock Cave Temple - a sacred Buddhist pilgrimage site for 22 centuries. This vast isolated rock mass with five caverns filled with statues is the largest and best preserved cave monastery in Sri Lanka. Afterwards check into your hotel in the heart of this historic region. Please dress appropriately when visiting Dambulla temple, with shoulders and knees covered. There is a steep uphill walk to the temple, so this excursion is not suitable for people with mobility issues. This morning we travel 30-minutes to Sigiriya - also known as Lion's Rock - a massive 5th century fortress and palace ruins surrounded by extensive gardens and reservoirs. Here you can climb 1,200 steps to the top of this amazing fortress in the sky that is now a World Heritage site, with the reward of incredible views. Ancient rock paintings are also on display. And don’t overlook the small museum near the entrance. Return to your hotel for lunch, before enjoying an afternoon jeep safari in Minneriya National Park. Birdlife is prolific in this park, where you can also hope to see wild Asian elephants. The elephants are particularly numerous in August and September, when they migrate along a corridor from neighbouring parks to feed on the fresh grass on the lake bed - an annual event known as "The Gathering". Note: If you have mobility issues, you can still view Sigiriay Rock from the gardens at the bottom. This morning we drive 1-hour to the ancient city of Polonnaruwa - the capital of Sri Lanka from the 11th to 13th centuries following the fall of Anuradhapura and today a World Heritage site. Here you can explore these magnificent ruins, which contains some fine examples of Buddah statues and marvel at this ancient civilisation, before returning to Habarana. The afternoon is free to relax at your hotel, where optional activities include riding an elephant, touring the local town in a bull cart or enjoying an Ayurvedic spa treatment. Please dress appropriately when visiting sacred sites, with shoulders and knees covered. This morning we travel 2.5-hours to the bustling hill capital of Kandy. In the late afternoon we visit the sacred Temple of the Tooth that houses a tooth relic of the Buddha. Religious pooja ceremonies, when the golden casket containing the tooth is revealed, are held daily at 05.00, 09.30 and 18.30 - so this is the best time to visit. Kandy was the last capital of the Sri Lankan kings and is a World Heritage site partly due to this temple. Its principal Buddhist complexes have considerable importance – the high priests of the two best known, Malwatte and Asgiriya, are the most important in Sri Lanka and the Asgiriya Maha Vihara has a large reclining Buddha image. In the evening enjoy a Cultural Show, with dancing and fire walking. Note: Please dress appropriately when visiting the temple, with shoulders and knees covered. We leave Kandy early this morning and, subject to the availability of tickets, transfer to Peradeniya station to board the 3.5-hour train to Nuwara Eliya in the heart of tea country (but be warned, this is an interesting cultural experience. It is not luxurious and the views you get will depend upon the seat you are allocated). Enjoy spectacular views of the countryside and the many tea plantations, as you wind through the hill country. Your guide will meet you at Nanu Oya railway station and take you to a local tea factory, before you check into your hotel. Please note that train tickets can only be booked 14 days in advance, with preference given to government officials. When train tickets are not available, a scenic 2-hour road transfer through the hill country will be substituted. An early morning (5 am) start this morning for our 1-hour drive to Horton Plains National Park - a magnificent landscape of rolling hills covered in cloud forests, with grasslands in the valleys that eventually give way to wetlands. Situated on the highest plateau in Sri Lanka, this park is home to 24 species of mammals and 87 species of birds - including 20 of the 27 endemic species found on this island. Enjoy a 5-mile (9.5-km) round trip self-guided hike along the scenic trail leading to World's End viewing point and Bakers' Falls, before returning to Nuwara Eliya - so wear trainers or walking boots. Today we leave Nuwara Eliya and travel.5-hours to Yala National Park. Along the way we view the cascading Ravana Waterfalls, with its backdrop of mountains and valleys. In Hindu mythology Sita, the wife of Rama, was hidden in caves behind these waterfalls when she was kidnapped from India and brought to Sri Lanka. We also detour to visit the ancient Buddhist temple at Buduruwagala, with its amazing seven statues dating back to the 10th century. It is in a very tranquil setting, well off the beaten track. We continue to Yala National Park, the premier game reserve in Sri Lanka covering an area of nearly 400 sq miles (1,000 sq.km). It is famous for having the highest density of leopards in the world, but sightings of these magnificent animals are not guaranteed and you need to take at least 2 or 3 jeep safaris for a good chance of a sighting. Note: Take a pair of socks to wear at Buduruwagala Temple, as the ground can get exceptionally hot when you remove your sandals. Rise early today to enjoy the wildlife of Yala National Park - home to over 40 different species of mammals and also known locally as Ruhuna National Park. Whilst famous for its over 35 leopards, you can also see water buffalo, elephants, spotted & barking deer, wild boar, sambar, crocodiles, jackals, monkeys and mongoose. Sloth bears are also present but are rarely seen. Bird life is particularly rewarding including excellent raptor sightings, many aquatic birds, wild peacock, jungle fowl (the national bird of Sri Lanka), hornbills, orioles, pelicans and the rare black-necked stork. Over 200 different bird species can be seen, including many that migrate to escape the northern winter such as white-winged black terns, curlews and pintails. Early morning and late afternoon is the best time to track leopards, but be aware that it is very difficult to find them in the wild and sightings are never guaranteed. Best viewings are generally at the end of the dry season (January to April), when the leopards search out the waterholes. Two jeep safaris per day are included - one in the early morning and one in the late afternoon. Note: Please be aware that although Yala National Park offers a wonderful wildlife experience, it is a very different experience from a traditional African safari as the park is extremely busy. Be prepared for some rough roads, with the park being especially busy over weekends and festivals. Yala is closed during September and early October. Today we travel 2-hours from Yala to Udawalawe National Park. Along the way we visit the pilgrimage town of Kataragama - sacred to the Buddhist, Hindu, Muslim and local Vedda people. Here you can view the Kiri Vehera, an ancient Buddhist stupa (sacred mound containing relics) dating back to the 6th century BC. There is also a multi-faith temple on the site. On arrival in Udawalawe enjoy a jeep safari in this wildlife reserve that was created to provide sanctuary for animals displaced by the Udawalawe Reservoir and offers the best sightings of wild Asian elephants in Sri Lanka. It is an important habitat for many water birds, as well as water buffalo, spotted deer, barking deer, wild boar, sambar, jackal, mongoose and jungle cat. The nocturnal fishing cat is also found here, but is rarely seen. Afterwards check into your hotel situated near the entrance to the park. This morning we visit the Udawalawe Elephant Transit Home that cares for orphaned calves and re-introduces them into the wild, where you can observe these youngsters coming in to feed. We then travel 3.5-hours to your hotel on the Galle Coast in the vicinity of the fortified town of Galle. Galle Fort has a colourful history, as it was originally built by the Portuguese and later heavily fortified by the Dutch. It is today a World Heritage site, with a multi-ethnic and multi-religious population living within its walls. After visiting the town your guide will drop you off at your beach hotel along this beautiful coast. At leisure to relax on the beautiful beaches of the Galle Coast. Optional day excursions are available to explore more of fascinating Galle Fort, with its many shops and markets, and walk along its ramparts. Prominent landmarks include the natural harbor, the National Maritime Museum, St. Mary's Cathedral founded by Jesuit priests and an important Shiva temple. 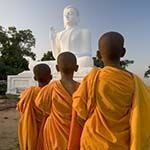 You can take an optional day trip to the imposing Buddhist temple at Mulkirigala, visit Kathaluwa Temple and the interesting Sri Lanka Air Force Museum in Katukurunda. Alternatively enjoy a canal boat ride to nearby islands where you can see water birds, monkeys and water monitors. The Turtle Hatchery is also well worth a visit, as from December to April sea turtles hatch on these beaches. From October to May you can also take an optional Whale Watching flight to see Blue whales from the air. Today transfer 45-minutes to Koggala Airport for a thrilling 45-minute flight over the Indian Ocean to search for Blue Whales from the air. These huge whales are found here in concentrations not seen elsewhere in the world. From November to April you can also hope to see the Bryde´s whale, Sperm whale, Fin whale and sometimes a Killer whale. Common dolphin, Bottlenose dolphin, Spinner dolphin, Risso's dolphin and Striped dolphin are also seen in these clear waters - so don’t forget your binoculars. Afterwards transfer back to your hotel, with balance of day at leisure. At leisure to relax on the beaches of the beautiful Galle Coast. Transfer 3.5-hours to Colombo Airport for your flight home.